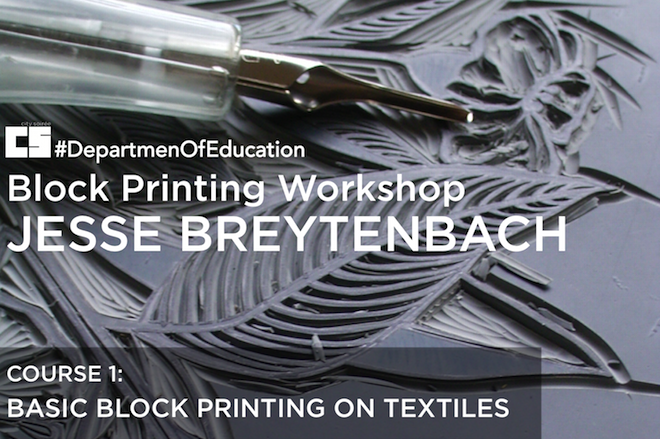 This event forms part of our #DepartmentOfEducation series of creative workshops. Jesse is a freelance illustrator and printmaker working in Cape Town. How to carve printing blocks, preparing blocks for printing, printing, overprinting colours, using simple shapes to create repeat patterns. Basic materials will be provided (linoleum, perspex, rollers), but participants will need to supply some of their own. Art supplies can be purchased at Artsource where the workshop will take place (ink, linocutting tools, extra linoleum, pencils, paper). Participants can purchase fabric for printing on from Jesse (hemp-cotton blend 1m x 1,4m @ R90 a piece). Click here to contact Jesse directly to order fabric. Participants are encouraged to bring their own fabric; all fabric needs to be cotton, linen, or other plant fibre, of a light colour, and washed and ironed. fabric for printing on, washed and ironed. Templates will be provided for a basic cushion cover, a tote bag, a purse, and a fabric bucket. Ticket sales close on 17 July 2015.